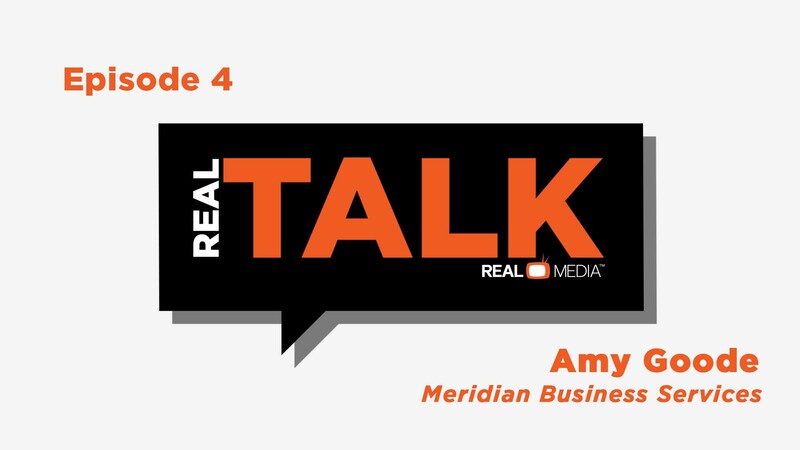 Real Talk with Real Media, I’m Joel Goldberg joined by Amy Goode of Meridian, CEO. Tell us a little bit about your company history and how you got to where you are today. AG: We’ve been around for 15 years. I started the firm after I left public accounting, where I was an auditor in the Big Four accounting world. And I decided I wanted to help small business owners, and that’s where we all started. JG: How much more do you enjoy this life now? AG: Much more, I love it. JG: What do you like more about it? AG: Really getting involved with those business owners and understanding the company, making an impact every day, every day that we work with them. JG: And how is that different than your previous life? AG: Well, long projects, a lot of presentations, a lot of review, a lot of feedback, things like that. And I’m ready and able to jump in whenever that business owner needs me, so. JG: And where has it evolved to over those 15 years? AG: We started out really more of a traditional CPA firm, where we worked accounting, tax, anything that businesses needed for a back office. As we worked with business owners, one of the main needs was around systems. And so we evolved the company to actually help companies from a systems perspective, be it small QuickBooks level, all the way up to a Cloud based DOP system called Net Suite. So not we implement the system, help them run it, train then, and so we’re able to be there for a lot more. JG: And I’m sure something different every single day. JG: What is it that your company does better than everyone else? AG: I feel like a lot of companies out there sell software. They work in more of an IT approach to selling that software. We are really accountants that have been in CFO roles, that have had to put systems in place, be it Oracle, SAP, large systems, that we’ve had the experience. And so when we sell a company a solution, we’re there in the trenches teaching them how to use it, understanding their needs. And if it needs to even expand to other solutions, we’ve got that knowledge and background. So we take it a step further, and that’s what our clients give us as feedback. And we feel very proud that we can do that for folks. JG: So there is, of course, the sales element to it, you are selling. But you’re selling as someone who has been involved in that before too. What type of feedback do you get because of the experience that you all have? AG: A lot of it is we listen to their … you’re always solving business problems. And so when those problems are there, we understand and have usually been involved in those same situations in the past, and have the war wounds and can help them really understand it and have ways to fix that. And so the feedback we get and the praise is that we approach it very holistically, versus not a software vendor, sales person, but a solution partner. Not even just providing software, but partnering them from the beginning and then staying involved throughout the entire relationship. JG: Yeah, I like that solution partner. It’s not just about sales. You also mentioned another key word which applies to everything in life and business, listening. How important is that? AG: We think it’s critical, and that’s a big part of our sales process. I even pushback on my sales guys now, and then they’re implementing during the sales process, but that’s why we’re so good at it. We make a difference and understand, listen to what they have going on. JG: Had this company now for about 15 years, let’s talk about the future. Where do you see things going? AG: Well, as I described we are growing on the software side of our business tremendously. So right now we’re working in the Midwest with quite a few companies. Recently we’ve seen that expand to companies that are international. And so we have the fortunate opportunity to be able to grow and expand that side of our business tremendously. We also continue to focus in on our accounting clients here in the Midwest. So with the two divisions, I think we grow here in the Midwest on the accounting side and tax side. And then from the Net Suite solution provider side of the house, the sky’s the limit. We have associates in both coasts right now to support people in the field. I have a staff member in Oregon, we have Florida resources we can expend wherever you need us to do that, and we continue hiring and growing. JG: And you said that the sky is the limit, so a high ceiling here. How far have you come in terms of growth, being now on the coast? How much of a recent development is that? AG: About the last six months really I’d say. And with the technology we’re selling, we’re fortunate it’s a Cloud based system so we can work in that environment that way. And our clients are needing it and demanding it, and really the industry is pushing everyone to be able to work in that type of global economy. JG: And so internationally, any specific goals going forward? AG: You know, we have some partners that are in the UK and Asia, and so that’s where a lot of our time is being spend and efforts. And so we see a bright future. JG: Let’s talk about one of my favorite topics, culture. Tell me about the culture of Meridian and why it’s important? AG: I think the culture is really learning and adapting, listening to our clients. Being in a technology field, we have got to be nimble and understand and always be pushing ourselves to learn. We do have a mix of generational knowledge and wealth, some young folks in the organization and some old timers like myself, and so teaching each other all the time is really important to our culture. JG: That’s really interesting to me too because there’s so much talk about millennials. Do they know enough? Do they know too much? How do you blend? And I think that you have to find a way to all work together. So you talked about teaching each other, how important is that? AG: I learn every day from them. There are so many new things. And it’s not just the technical things. It’s communicating, it’s understanding what motivates people. And I feel like I really teach them as well. And then giving them the opportunity to take the time out of a crazy busy schedule. There’s always a client demanding something, but making the effort to take time to train, and understand, and advance their careers and development is really a big part of our culture. JG: And how much of that relies on trust and independence to know that they can go and do that? AG: Yes, I feel like it’s important and they really value it. It really is good for all of us. JG: Yeah, we’ve talked about culture, we’ve talked about the history of your company, but let’s talk now about an important element to any company, giving back. How do you guys give back to Kansas City? AG: We really embrace the community. I grew up in Kansas City and there are a lot of different ways, from being a Meridian team of runners in races, to a lot of things. But something that we’ve really done that we’re proud of is there’s a grant program that we’ve been able to leverage to provide free technology to companies so that they can … nonprofit organizations may not have the budgets to use what’s out there like the rest of the commercial community. And so we’ve been able to provide grants, all of our services at very discount rates, so that they can get and embrace the technology. And so we’ve done a lot of different things with that. AG: I’m also on boards with a number of organizations so that we can work with the community all the time. And so along with scholarships to schools and organizations that Meridian offers, we feel like we do a good job giving back. And it’s important. JG: So we’ve talked about culture, I want to know what it does for your employees to be able to be involved in the community. Giving back always feels great, so how does it affect them? AG: I think there’s a sense of empowerment and pride in what Meridian does. I think particularly in our younger generation, really gets them out of their comfort zone and I can see a maturity in them and a pride in not just what Meridian does, but what they feel like they can do to make a difference. JG: Gives them some purpose, right? A little bit of a, beyond just … and that’s really what you’re trying to do with your clients too, right? You’re trying to give to your clients, be able to provide something. But when they can go out there and you, and get out in the community, can you see the effects? AG: Absolutely. And most of them have some of the greatest ideas and new things that we do next. And so the few steps that I took to get started, they’re the ones that are carrying it forward. JG: So that’s that empowerment that you’re talking about, all part of the culture and the importance of giving back. She is Amy Goode, CEO of Meridian. I’m Joel Goldberg, Real Talk with Real Media.